OTTAWA, Canada – As a Canadian, I'm supposed to be used to extremes. I've commuted across the city many times in snowstorms, skated on an outdoor canal in blistering cold and played soccer in the humid soup of 104 degrees Fahrenheit (40 degrees Celsius). So why do I feel so intimidated as I stare at the packing list for the two-week Mars Society mission I'm going to be on? I'm used to fluctuating temperatures, dressing in layers and even a bit of camping. As I go down the list — hiking boots, sleeping bag, pillow, possibly a Swiss Army knife — I realize it's not so much the stuff itself that worries me, but getting it across the continent to Utah in a month's time. MDRS sits in a remote area, a few miles from the town of Hanksville, Utah and about four hours south of Salt Lake City. By luck, my mostly-UND crew has a fully trained medical doctor. I'm also grateful that my commander (Paula Crock) also has wilderness first responder training and spent several months in Antarctica. The Mars Society bills MDRS as a way to simulate Mars and space exploration. It'll be fun, but in the hard work sense. The environment will be isolated. We will mostly rely on the food that is available on site. While doing our experiments, we'll live in a small habitat, with limited power supplies and Internet. We can't even go outside without donning spacesuits. It's not a perfect simulation, however. The big difference: Real space crews spend months or years working on a mission, taking the time to bond as people before going. Me, I'm about to spend a close-to-camping trip for two weeks with a group I barely know. The good news, though, is we're working hard to get to know each other. We've had numerous e-mail conversations to talk through mission logistics, and I've made a point of talking individually to my crewmates by phone, where possible. As I look at my crew's various scientific capabilities and degrees, I realize that as the communications-trained journalist I'm likely of a different mindset than the rest of them. Time to work on my compatibility skills. Rapidly. 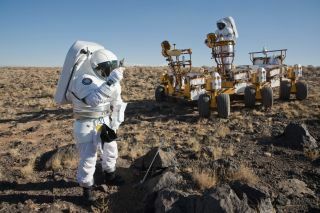 A previous crew from the Mars Desert Research Station in February 2013, including Crew 133 commander Paula Crock (No. 6 in the photo). My journey to MDRS will begin on Jan. 2, 2014, when — providing a snowstorm doesn't hold me up — I head to Las Vegas. From there, it's a seven-hour drive to Grand Junction, Colo., to meet up with the rest of my crew. We'll leave for MDRS as a group on Jan. 4, driving 2.5 hours southwest. We'll spend a few hours on site learning how to work — and how not to clog the toilet — and then the real fun begins. Six humans will get down to the science and engineering of studying the stars, seeking hydrothermal vents in the neighborhood, and testing out spacesuit technology. The last of us will remain until the official crew handover on Jan. 19 or 20, when it will be time for me to make my two-day trip back to Ottawa. I'll be filing regular updates and pictures for SPACE.com during those weeks. We also plan a video chat with SPACE.com midway through our mission. Have questions about our mission, or is there a picture of our site that you'd really love me to take? Let me know at contact@elizabethhowell.ca, and I'll try to address your queries in a future story.